Due to a policy set by the national office of the Young Eagles, all Young Eagles Registration forms have to be an original copy signed by the parents or guardians (not a grand parent or troop leader) on both the front and the back. We can no longer offer a downloadable registration form. If you need an original form to sign, please let me know at youngeagles@eaa32.org. We cannot email or fax these forms. If the parent is not able to make the event, we can snail-mail the forms but you must give us at least a weeks notice in order to get them in the mail. Now that you have flown, what's next??? May 11, June 8, July 13, August 10, September 14, and October 5 (first Saturday at Creve Coeur Airport), 2019. (The presentation includes all qualifications for Boy Scout Aviation Merit Badge, American Heritage Girls Aviation Badge and Junior through Senior Aviation Badge. If you have any questions about our Young Eagle program, please visit the national Young Eagles page. If you any questions, please email EAA 32's Coordinator at youngeagles@eaa32.org or call 636-250-4257. NOTE: Schedule subject to change due to weather or other unforeseeable events. For Pilots and Ground crew: Briefing begins at 8:30am. If you miss the briefing, please see the crew chief for details. *If other members of your troop have signed up for April, May, June, or August, please contact me at youngeagles@eaa32.org. So now that you have flown, what's next? EAA has announced the Young Eagles Flight Plan, which has developed a number of new programs to encourage young people to consider flying and aviation careers. Key elements include the Young Eagles Flight, Sporty's online Next Step Program, a free First Flight Lesson, flight training scholarships and awards, and a free EAA Student Membership. After completing a Young Eagles Flight, you'll have access to the Sporty's Complete Pilot Training Course. This course is the Next Step in the Flight Plan and a great way to begin your aviation education. (Recommended for ages 13 and older.) The course is a $215 value and is offered free from Sporty's Pilot Shop. Once you have completed part one (the recreational pilot course) of the Sporty's program, you'll receive a voucher from EAA for a free First Flight Lesson at a flight school of your choice. (You must be between ages 14 and 19 to qualify.) This $120 value is underwritten by Global Aerospace and the Jim and Angela Thompson Foundation. When you finish the Sporty's program, you'll be eligible to apply for funds to be used for flight training. These $1,500 flight awards and $7,500 flight scholarships are paid to your flight school to further your flight training. (You must be between ages 16 and 20 to qualify.) These flight awards and scholarships are underwritten by Rolls-Royce and the Harrison Ford Scholarship Fund at EAA. All Young Eagles will be offered a free EAA Student Membership. 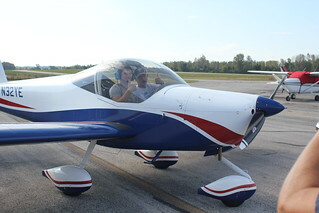 This membership will be valid until your 19th birthday and will include a membership card, e-newsletters, member discounts, and an electronic version of Sport Aviation. The EAA Student Membership is presented by Embry-Riddle Aeronautical University. More information will appear in the near future at www.YoungEagles.org. What is the Aviation Badge Workshop? The Aviation Badge workshop is designed for Boy Scouts, Girl Scouts (Juniors through Seniors), and the American Heritage Girls to earn their respective Aviation Badges. See below for the requirements met for each badge. The Aviation Badge workshop is offered on the second Saturday of the month from April through September (sometimes in October). It begins at 9am and runs about 3 hours. Does my child have to fly to earn the badge? No! We do not want to force any child to fly if they are unwilling. Each badge meets enough qualifications to earn it without flying. The Young Eagles program is a separate program offered by EAA and is not officially part of any of the badges. 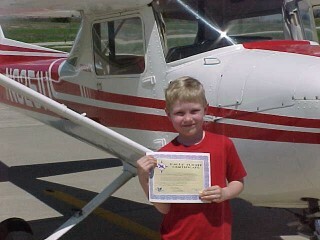 We encourage the kids to fly having just learned about airplanes and flight, but it is not required. Since the Girls Scouts forbid flying as an activity, the Girl Scouts must wait until after the badge workshop and remove their Girl Scout vest and become a "civilian" to if she wishes fly. See above requirements to fly as a Young Eagle. There is no charge for the Aviation Badge Workshop. All materials and activities are provided. The Troop leader is responsible for purchasing the badge, EAA does not have any badges for sale. The Aviation Badge workshop will be offered rain or shine. If the weather turns bad, the Young Eagle flights may be canceled, but that won't affect the Aviation Badge. The only time we had to cancel an Aviation Badge workshop was when the Mississippi river flooded the airport and we could not get to our building. Watch this web page for any flooding cancellation. Can I bring food or a snack? You are welcome to bring food or a snack to eat during break or after for lunch. Water bottles are encouraged as the hangar gets hot in the summer (there is no air conditioning). EAA Chapter 32 also offers hot dogs, hamburgers, chips, and drinks for a small cost (cash or check only). If you have any other questions, please email youngeagles@eaa32.org. If your child is interested in learning more about Aviation, please fill out the form below. This registration is recommended for Boy Scouts, Girl Scouts and American Heritage girls. Please note that space is limited. This information will not be shared with any other parties. It is only for the purpose of recording attendees and emergency contact information. If you child is unable to attend, please send an email to youngeagles@eaa32.org with his/her name and date he/she was expected to attend. Please Note: This sign up is for the Aviation Badge Workshop ONLY! You do not need to sign up if you are only taking the Young Eagle flight. Those registrations forms are available the morning of the event. Prior to coming to the Aviation Merit Badge workshop, the Scout will need contact his Scout Master for copies of the merit badge application and fill out all the appropriate sections (name, address, badge, etc) . The Scout Master needs to approve the merit badge and sign the application before the scout can attend the workshop. EAA Chapter 32 does not have any copies of the merit badge applications nor badges. Your Scout Master will provide the necessary help in obtaining the badges after the workshop is complete. EAA Chapter 32 Aviation Merit Badge Councilor will present a workshop with the information needed to complete the Aviation Merit Badge beginning at 9am and ending about noon. The students will then be tested and the merit badge application will be signed by the Aviation Merit Badge Councilor following the presentation. Return the completed workbook and merit badge application to your Scout Master after completion. The Boy Scout may receive a Young Eagles flight during the course of the presentation. The flight is optional. This is not needed as a part of the Merit Badge as enough activities will be completed for the badge. A parent or legal guardian (not the Scout Master) needs to sign a Young Eagle Registration form prior to the flight taking place. If a parent or legal guardian is not able to attend with the scout, they may request a registration form to mailed to them 2 weeks prior to the event. The form must be an original copy Photo copies and faxes are not accepted by our national Young Eagles office. Please contact us at youngeagles@eaa32.org if you have any questions. c. Obtain and learn how to read an aeronautical chart. 5. Find out about three career opportunities in aviation. An Aviation Merit Badge Councilor will be available at most Young Eagle Events at noon, to test and sign off your scout. Please contact the Young Eagles at youngeagles@eaa32.org to confirm this with each event. If you wish to speak to a Merit Badge Councilor, please email youngeagles@eaa32.org and we will connect you with one. For other aviation related activities, see EAA's Aviation Activity Cookbook with activities for Elementary, Middle School and High School students. Includes Aviation Curricular Activities for the three levels. We are happy to announce that we have found a Girl Scout Aviation Badge that is GSUSA approved badge (not a patch!) for Juniors, Cadettes, and Seniors. Terri Sanders, a GS Troop Leader from Kentucky worked with the Kentucky Bluegrass Ninety-Nines to create these badges to get girls interested in Aviation. The Aviation badges can be purchased for $3 each through PayPal at tgsanders@att.net or check via P.O. box 123 Pendleton KY 40055. Please include level needed and mailing address in your order. You will have to purchase these badges on your own. EAA Chapter 32 does not have any badges. The Aviation Badge Session will cover material for all three badges so girls of any age group are welcome. How does weather affect aircraft? Talk with a meteorologist about weather patterns. What are the main airplane parts? What purpose do they serve? Explain the difference between piston, turboprop and jet engines. How would you define “aircraft”? What makes a plane fly? Name the different kinds and uses of aircraft. How have the uses changed over the years? Aeronautical charts are used for navigation. Pilots must carry one on every flight. Learn 15 different symbols on the chart. What are the requirements for the general aviation path to get your Private Pilot Certificate? Visit your local airport to find out about their facilities. How many runways do they have? How are they numbered? How can you tell the active runways? Explore 3 careers related to aviation. What education, training and experience do you need for each profession? Which profession would be your favorite and why? Learn what it takes to make aircraft fly. What are the forces that act on the aircraft? Helicopters are very useful for many tasks. What makes a helicopter fly? Name 5 uses for helicopters. Make a list of at least 15 different roles that are involved in air transportation. Pick your 3 favorite and find out details about each including education, age, experience, etc. Do research or interview people in those roles. What are the types of aeronautical charts that pilots use to navigate? Obtain some from different cities and compare the similarities and differences. Learn symbols from the legend and their significance. Take a tour of a general aviation airport. What characteristics does a general aviation airport have? What does it take to become an airline pilot? Research or interview someone from that profession. What education classes are needed to prepare someone for that career? What jobs are available in your community? Using a model airplane, explain the forces that act on an aircraft in flight. Include lift, weight, drag and thrust. Explore the challenges that stand in the way of obtaining a private pilot certificate. Include economic, culture, gender, location and aircraft availability. Obtain and learn how to read an aeronautical chart . Research the parts of an aircraft and name their function. Experience flying through a flight simulator. Become familiar with the skills needed to taxi, take off, climb, bank, set headings and land. Describe the differences in training and certification for sport, recreational, lighter than air or private pilot and instrument, glider and seaplane rating. The Aviation Badge Session will cover the following to meet the AHG Aviation Badge. How do airplanes fly? Include 4 forces of flight. What are airplanes used for? a. List some things a helicopter can do which convention aircraft cannot. Identify the parts of an aircraft. Tour a cockpit or using a poster or diagram of a cockpit, identify at least three of the six primary flight instruments. a Visit an airport with your troop. Talk with the operator of a flight school or with a flight instructor about the different types of aircraft that fly in and out of their facility. Does this airport have a control tower? If not, how do pilots communicate with each other? c. Explain with drawing what the airplane does in yaw and pitch. Learn about training requirements to become a pilot. a Look over an aeronautical chart for your area. Identify the various types of airfields/airports, control airspace, obstructions and geographical features. c. Explain how both the propeller and jet powerplants provide thrust for an aircraft. Stomp Rockets have become a very popular activity for kids at our Young Eagle Events. Easy to make and fun to launch, kids of all ages love the stomp rockets. See the map for directions to Smartt Field (St. Charles County Airport). Leave a message on the hot-line answering machine 314-286-9932 if you are interested in participating in a Young Eagle's flight, or if you have any questions. Flights are on a first-come first-serve basis. No appointments necessary! Young Eagles must be between the ages of 8 and 17. Adults and children under the age of 8 may fly along with a Young Eagle as long as there is no other Young Eagles waiting for flights. Flights may be canceled at any time due to weather conditions (thunderstorms, high winds, etc.) or lack of airplanes. Safety is our major concern, please watch you children and keep them clear of active areas at all time. Have you ever wondered what it's like to fly? Young Eagles don't have to imagine what flying is like. Each Young Eagle will become part of a special group of people who have shared in a common experience - the thrill of flying! You will have the change to actually fly in an airplane and look at the world below you. You are invited to take to the skies and become a Young Eagle. What do I have to do to become a Young Eagle? You must be between age 8 and 17 years old, and have a parent or guardian complete the registration form. Come with a parent or guardian to an event or when you visit with the pilot. Parents or guardian must sign both sides of an original Young Eagle Registration form. Sorry, we can't provide downloadable or xerox copies any more (due to new EAA rules). Your pilot will take you on a pre-flight briefing of the plane and then take you for a 20-30 minute flight. Upon your return, you will receive a certificate signed by the pilot. Click here for Pilot Guidelines. Complete the appropriate Young Eagles registration form before the flight, signed by you and each of your passengers. A parent or legal guardian signature is required for all Young Eagles flights.